Rejuicenate is the brainchild of chef Chris Remaley from New York with the expertise of nutritionist consultant Berthsy Ayide. Having grown up in his grandmother's farm in Pennsylvania, Chris forged his love and relationship with natural organic food since young, way before the term "organic" was even commercialised in today's context. 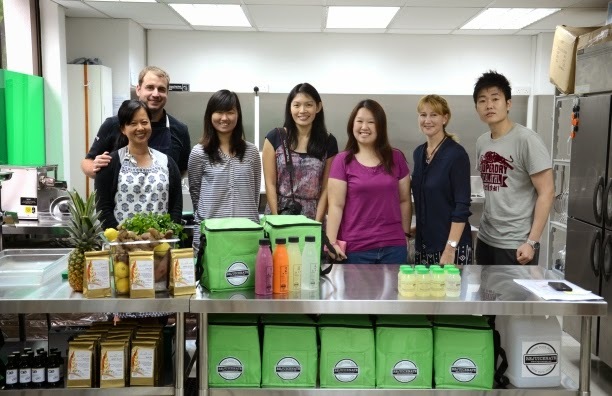 He brings with him Singapore's first organic cold-pressed juice cleanse system - Rejuicenate! Before coming to Singapore, the Michelin-trained chef honed his skills and palate working as private chef to celebrities such as Robert De Niro and had worked in various countries. 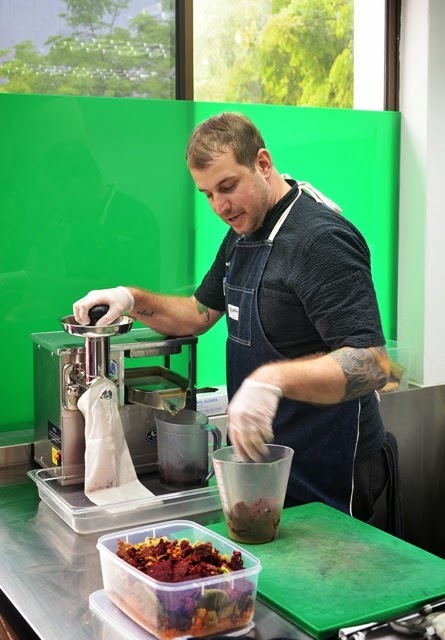 Chris takes pride in combining the best nutritional qualities of selected locally sourced organic farm-fresh produce and great tasting fruit and vegetable juices through his cold-press methods. 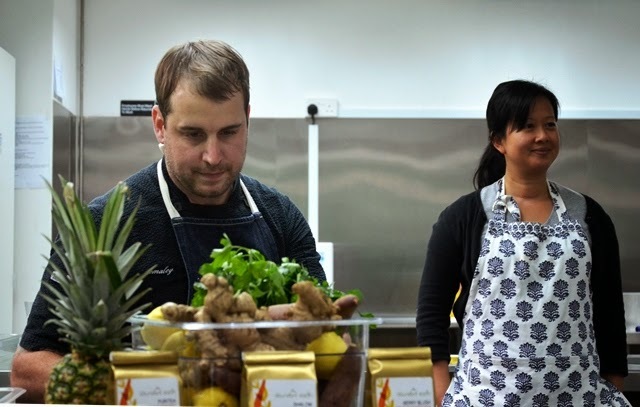 In his efforts to support the local farming industries, he works closely with organic farmers in Singapore, Malaysia and Thailand. Having the intimate relationship with these farmers allow him to have specially grown crops such as English parsley, black kale and sugarloaf pineapples just to name a few. Quite frankly, I have always been quite cynical about the alleged benefits of organic food but paying attention to Chris' insights about organic food was enlightening indeed. When it comes to juices, it is especially important to have them derived from organic produce simply to eliminate any traces of toxins, chemicals that might be present. Considering that we are consuming fruit juices raw and unpasteurised, it is important that the ingredients are not polluted by chemicals harmful for the body else you are merely feeding yourself toxins. Also, an interesting point shared by Chris' wife, Bowie, was that if you can't pronounce the name of a particular ingredient or does not know what it is, why would you want that in your body? 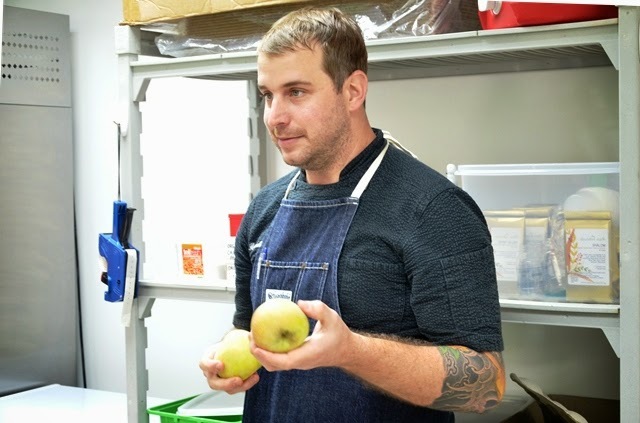 Chef Chris, "Organic fruits may not look good but they are surely much more beneficial for your body"
How is Rejuicenate different from other juices? It is not just about delivering quality juices to customers like it is coming from any commercial juicing factory. At Rejuicenate, much pride is placed on understanding the source of the ingredients and improvising recipes and menus based on the seasonal availability of fresh produce. Further to the product, Rejuicenate seeks to understand the needs and dietary requirements of their customers before having their certified nutritionist to plan a suitable cleansing programme. The common saying goes, "If something tastes too good, it is most probably bad for your body". Chris strives to defy that notion through his ingenious blends with some concoctions taking up to one year to refine its taste and flavours. 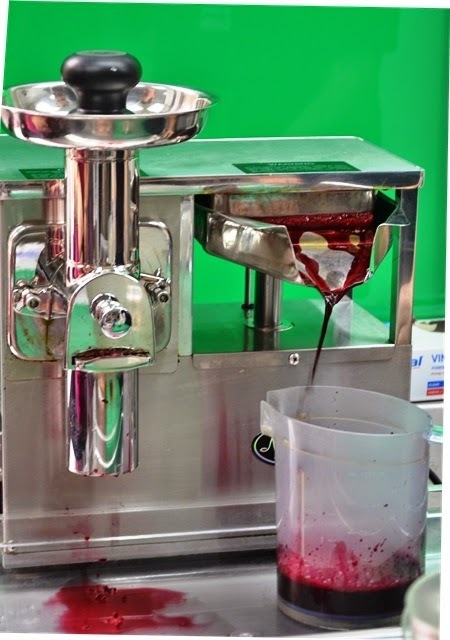 In order to have the best extracts from the quality ingredients, Chris uses the Norwalk cold press machine which yields 50-100% more juice and retains three to five times more enzymes, vitamins and minerals as compared to a conventional juicer. Also, alkaline water which is up to three times more effective compared to plain tap water is used, which typically aids cleansing process better as most people eat a highly acidic diet. Regarded as the "Ferrari" of cold-pressed juicers, the Norwalk pulverises the ingredients in a fine mesh cloth. The lack of heat or friction during the process minimises the loss of vitamins and minerals. Thereafter, the cloth bag is folded and passed on to the second stage of treatment by the Norwalk Hydraulic Press which exerts three tonnes of pressure to extract all juices, leaving the composite dry and deplete of all nutritional values. With a shelf-life of just three days for all juices in order to retain freshness, the juicing process has to be conducted in a temperature-sensitive environment and all orders are delivered on the same day of process. The Rejuicenate experience does not stop there. Instead, Chris builds a personal relationship with each of his client by email correspondence or even Skype or Facetime before and after the start of each cleansing programme in order to provide maximum support and more importantly to address any underlying concerns one might have. Chris on his organic produce as he prepares for the blind tasting test. We were given a blind tasting test whereby we were given two cups of juices labelled A and B. The waft of fragrance from Chris' Roots blend won us over almost immediately with ingredients such as carson carrot, purple carrot, honeycrisp apple and young ginger. So....what are the benefits of cleansing your body? Apart from a boost to your immune system, going on a cleansing programme helps to give one clarity of thought and sharper cognitive functions. Flushing the toxins out from one's body also gives you a glowing look and clearer complexion and it is common knowledge by now that it reduces the risk of illnesses and diseases. In order to ease into the healing process of detoxification and lessen the shock to one's body system, it is important to prepare your body and as such, it is recommended to reduce intake of heavy and processed food such as meat, dairy, refined starches (rice, pasta, cakes, etc), alcohol and caffeine at least three days prior to starting the programme. If one is on the programme, Chris would be consistently communicating via emails and sending you reminders and dietary tips on what you should be consuming. During the cleansing process, some common symptoms might be experienced, which include tiredness, fatigue, mild headaches. This is actually a good sign that your body is reacting and flushing out the toxins from within. Just remember to take plenty of water to aid the detox process. Breaking out from the cleansing programme should be gradual and one could start by reintroducing small meals that incorporate both solids and liquids into your diet. There are various packages offered in either three or five days to kickstart your cleansing and detox programme. 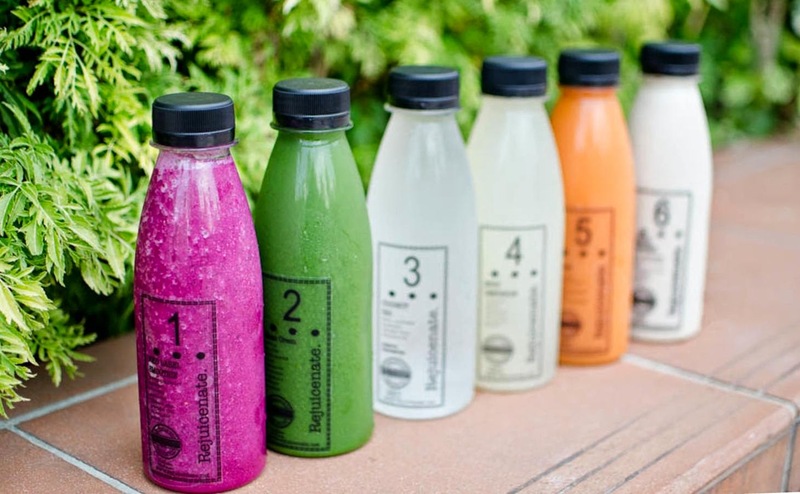 The basic Rejuicenation Cleanse starts from S$320 for the three days course and goes up to S$500 for the five day programme where you will have the opportunity to try the full range of juices. There is also the advanced programme, Foundation Cleanse, where one of the juices, Bowie's Brew, was named after Bowie and is more vegetable-based starting at S$330 and goes up to S$515. For the experienced cleansers, there is the Elimination Cleanse which is a more intense detox programme which starts at S$340 and up to S$530. Among the other detox cleaners, Rejuicenate also offers a healthy six pack of juices to supplement one's daily hectic routine. Similarly, teabags and cleanse enhances such as skin brush and grapefruit oil are also offered to complement one's detox programme. For more information, please visit http://rejuicenate.net/. It was an enlightening trip down to Rejuicenate indeed and the knowledge takeaway was tremendous. We are grateful to Jeanette for the invitation and the lovely couple for having us. I was lucky enough to win the lucky draw pick of the six pack juices, and off to a detox programme! Hi, your post details are inaccurate. 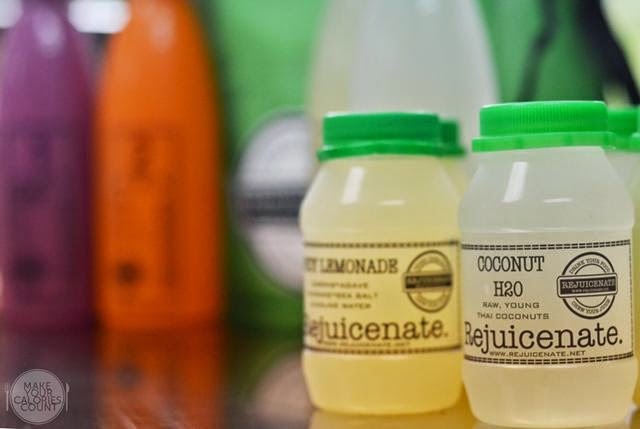 Rejuicenate is not the first organic Cold Pressed company. Sana Cleanse and Hicjuice has been established a year before them. Check facts before blogging!